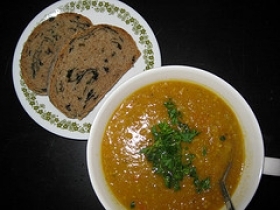 Have you made Butternut Squash And Apple Soup? 1. PREPARE THE VEGETABLES AND APPLES: Peel the onion, leaving a little of the root attached, and cut it lengthwise in half. 2. Lay each onion half on a cutting board and slice horizontally toward the root, leaving the slices attached at the root end. 3. Make a series of vertical cuts through the onion, cutting just to the root, but not through it. 4. Finally, cut across the onion to make a dice. 5. Set the flat side of a chef's knife on top of the garlic clove and strike it with you fist. 6. Discard the skin and finely chop the garlic clove. 7. Peel and finely chop the ginger root. Using a vegetable peeler, peel the skin from the butternut squash and discard. 8. Cut the squash lengthwise in half then into quarters. 9. Cut out and discard the seeds and fibers. With a chef's knife, cut the flesh of the squash crosswise into 3/4-inch chunks and set aside. 10. Peel the skin from the apples with the vegetable peeler. 11. With a small knife, cut the flower and stem ends from the apples. 12. Cut the apples in half, then in quarters. Cut out the cores and cut the apples into 3/4-inch cubes. 13. Put the apple cubes in a bowl, sprinkle with lemon juice and toss to coat evenly. 14. 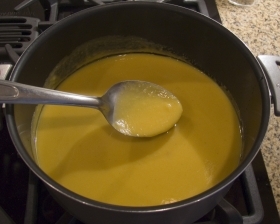 MAKE THE SOUP: Melt the butter in a large pot. 15. Add the onion, garlic, and ginger root and cook, stirring, until the onion is soft, 2 - 3 minutes. 16. 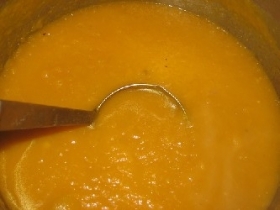 Stir the cubes of squash and apple into the pot. 17. Season to taste with salt and pepper. Pour in the stock and bring to a boil. 18. 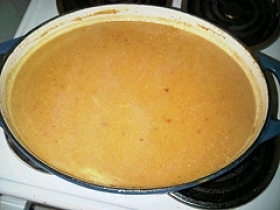 Cover and simmer gently, stirring occasionally, until the squash and apples are very tender, about 40 minutes. 19. Meanwhile, make the fried spiced croutons. 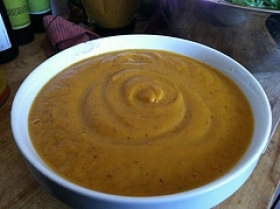 Remove the soup from the heat, let cool slightly, then puree it in a food processor or blender. 20. Reheat the soup, then add the apple juice and stir well to mix. 21. If the soup is too thick, add a little more stock. 22. Taste the soup for seasoning. Ladle the soup into warmed individual bowls. 23. If serving with croutons, sprinkle a few in the center of each bowl and pass around extras. 24. FRIED SPICED CROUTONS: Cut three slices of bread into 3/8-inch cubes. 25. In a small bowl, combine 1 teaspoon curry powder and one large pinch each of ground nutmeg and cardamom, and add pepper to taste. 26. Heat 3 - 4 tablespoons oil in a frying pan over medium heat. 27. Add the bread cubes and fry, stirring, until brown on all sides, 2 - 3 minutes. 28. Sprinkle the spice mixture over the croutons, stir to mix, then take the pan from the heat immediately. 29. Lift out the croutons with a slotted spoon and drain well on paper towels. 30. 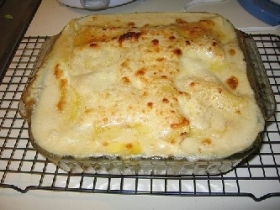 VARIATION: Omit the Granny Smith apples from the recipe. 31. While the soup is cooking, make an apple confit. 32. Melt 1 tablespoon butter in a medium-size saute pan and add 2 peeled and dice McIntosh apples. 33. When they're heated through, add 1/2 cup apple juice, cover the pan, and cook over medium heat for 15 to 20 minutes, until soft; cook, uncovered, for 8 to 10 minutes to reduce the liquid. 34. Mash the apples, making sure the confit retains some texture. 35. Stir half the confit into the soup, saving the rest to stir into each serving. 36. season the soup with salt and pepper to taste. 37. Add a spoonful of apple confit and a swirl of creme fraiche to each serving. 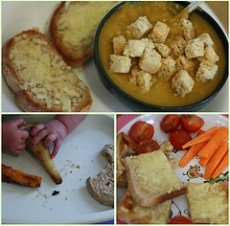 This recipe contains potential food allergens and will effect people with Wheat, Lemon, Butter, Gluten, MSG, Poultry, Garlic, Fructose Malabsorption, Onion, Apple, Citric Acid allergies.